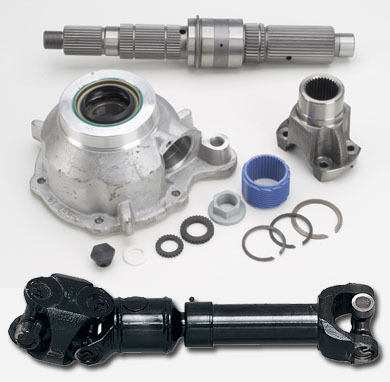 Combo kit includes Rugged Ridge HD SYE (18676.60, formerly #52231) and Rubicon Express RE1860 CV driveshaft. To properly process your order, we will need to know how long your stock driveshaft is. Just measure from center to center at the u-joints as in this picture. Have you lifted your Jeep and now have driveshaft vibration problems? Install this Slip Yoke Eliminator kit and reduce or eliminate that annoying noise and vibration. Transfer case tailshaft length is reduced by 6.5" on '97-'03 Wranglers and 4.25" on '88-'95 Wranglers reducing the driveline angles. Kit comes with a heavy-duty rear output shaft which is shorter and has 18% larger spline diameter and a 54% increase in torque capacity. New aluminum rear output housing, bearings, seals, snap rings, bolts and instructions. Spicer driveshafts and components are as good as they get. This driveshaft is compatible with the RE1811 Slip yoke eliminator kit, Atlas transfer cases and any other 1310 series CV yoke. Measurements are taken center to center on the u-joint with the slip stub at the center of its travel. Measure your vehicle on the ground in the running position to get correct length. *Some models may require mode fork shift rail to be shortened. CV/double-cardan style driveshafts require the axle pinion to be rotated inline with the driveshaft. Shims or adjustable control arms are needed for this, depending on if you've got a leaf spring or coil spring suspension.